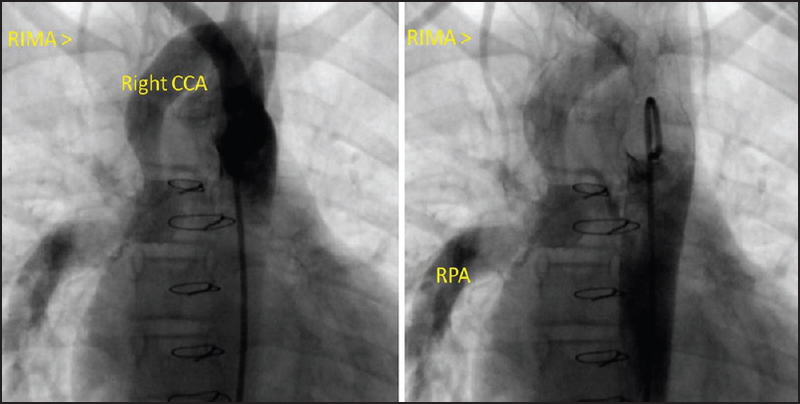 Classical Blalock-Taussig shunt was once a commonly performed palliative procedure. Most often being an emergency procedure, it was performed on children without any comprehensive assessment. Herewith, we report a patient with an aortic arch variant with a common carotid trunk for whom "classical Blalock-Taussig shunt" was performed with right common carotid artery confusing it with the right subclavian artery. A 14-year-old female diagnosed as double inlet left ventricle, and pulmonary stenosis was admitted in our Institute in 2013. In 1999, she underwent a right classical Blalock-Taussig shunt at 5 months of age for recurrent cyanotic spells elsewhere. She developed seizures on the 2 nd postoperative day and had multiple episodes in the next few days which subsided on antiepileptic drugs. Computed tomography (CT) brain was essentially normal, and she was followed up with antiepileptic drugs. At 8 years of age (2007), Glenn shunt was attempted. Intraoperative measurement of right pulmonary artery pressure was found to be 16 mmHg. Hence, the surgery was deferred. At present, she has good right radial pulses and absent right carotid pulses. 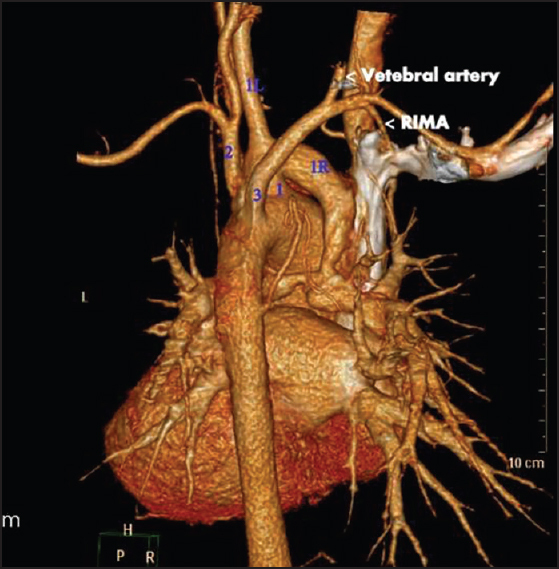 CT imaging showed an Adachi and Williams "type H" type of aortic arch branching pattern  wherein the first branch was the common bicarotid trunk, followed by the left subclavian artery, and lastly the aberrant right subclavian artery. The right common carotid artery was anastomosed to the right pulmonary artery, and there was a stenosis at the confluence of the pulmonary artery [Figure 1]. Angiogram confirmed the branching pattern with flow from the right subclavian artery to the right internal mammary artery and vertebral artery [Figure 2]. The hemodynamic study measured the left pulmonary artery pressure as 12 mmHg while that of the right pulmonary artery as 16 mmHg, due to the stenosis at the confluence. Hence, a bidirectional Glenn shunt and patch plasty of the pulmonary confluence with takedown of classical Blalock-Taussig shunt was performed. Postoperatively, the Glenn pressure was 13 mmHg, and the child had a normal postoperative recovery. Variations in the branching of aorta arch are seen in one in every five patients. Adachi and Williams type H pattern of arch vessels constitute <1% of aortic branching pattern with very few reported cases in the literature. Comprehensive knowledge of the aortic arch and its branches is crucial in performing surgeries on the arch and its vessels. During cyanotic spells, it is not uncommon to find patients being wheeled inside operating room for emergency procedures before detailed study of the aortic arch and its branches are done. In our patient, unaware of the arch anomaly, the surgeon, after right thoracotomy, had misidentified the right common carotid artery as right subclavian artery and the bicarotid trunk as an innominate artery. The "classical Blalock-Taussig shunt" was performed using the right common carotid artery. Sudden deprivation of blood from the right carotid artery resulted in hypoxic seizures which recovered without any residual lesions as the left carotid and vertebral system became dominant. The surgeons in 2008 have measured the right pulmonary artery pressure which was spuriously high due to the shunt and stenosis at the confluence. Though classical Blalock-Taussig shunt is not performed in the current era, a comprehensive assessment of aortic arch and its branches is especially important for subsequent interventional or surgical procedures. Rogers AD, Nel M, Eloff EP, Naidoo NG. Dysphagia lusoria: A case of an aberrant right subclavian artery and a bicarotid trunk. ISRN Surg 2011;2011:819295.